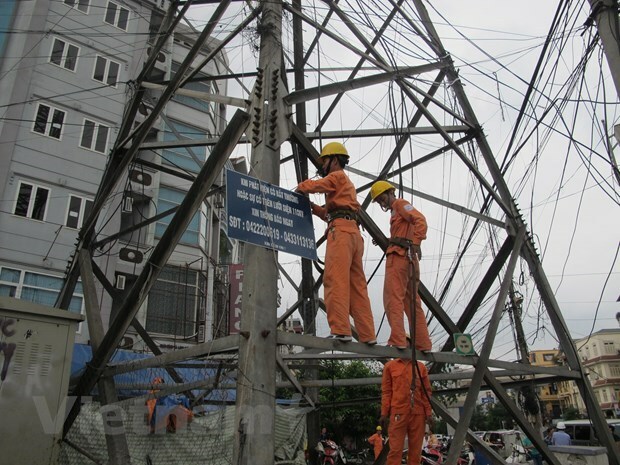 Hanoi (VNA) – The Electricity Vietnam’s Central Power Corporation (EVNCPC) has announced that it plans to invest over 7.3 trillion VND (317 million USD) in a power grid in the central and Central Highland provinces this year. Of the figure, 215.6 billion VND will be from the State budget, over 3.1 trillion VND is its own capital, more than 998.3 billion VND is foreign loans and the remaining is commercial loans. It will put into operation the first stage of a 10MW solar power plant in the south central province of Khanh Hoa in June 2019 and the whole plant in August 2019, and the second and third stage of a solar roof tile project in the first and second quarter this year, respectively. Apart from putting into use 51 110kV power grid works this year, EVNCPC will also launch three sub-projects on power distribution funded by the Germany’s KfW Development Bank in the central province of Thua Thien-Hue, the Central Highlands provinces of Gia Lai and Kon Tum, a power supply project using submarine cable system in Nhon Chau island, the central province of Binh Dinh, a sub-project using loan from the Japan International Cooperation Agency (JICA) in Son Tra district, the central city of Da Nang and three sub-projects with JICA loans in Phu Yen, Dak Lak and Da Nang. The corporation will focus on highly effective projects on preventing power oversupply, providing electricity for industries and services, review the effectiveness of grid works each year and the five-year plan in each area.